OUR 2018 JESUS SAVES! 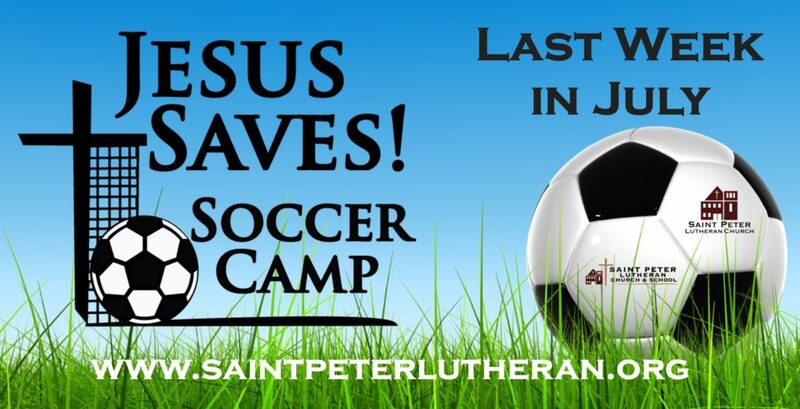 SOCCER CAMP IS FULL! REGISTRATION HAS NOW CLOSED. Jesus Saves! Soccer Camp is a free, four-day soccer camp open to all children ages 5-12. It is held during the last week of July each summer, from 9 a.m. – 12 p.m. from Monday through Thursday at Gault Park (1901 N. Sunrise Drive) in Saint Peter. Our 2018 camp will be held from July 23-26, 2018. Our 2018 Jesus Saves! Soccer Camp is now full, with over 165 kids registered. Registration has now closed. At our camp, participants are divided into teams based on their age level. Each team is coached throughout the week by one head coach and a number of assistant coaches. Each day includes warm-up exercises, soccer drills, a skill for the day, and numerous games and scrimmages. Also included are snacks, water breaks, and a daily devotion from God’s Word from one of the pastors at Saint Peter Lutheran Church. Each participant is responsible to bring their own soccer shoes and sunscreen. Shin guards are mandatory and must be worn at all times. Due to the risk of injury, players without shin guards will not be able to participate. Parents should also be aware that our coaches and volunteers will not apply sunscreen to individual players. We will provide a camp jersey, water bottle, and daily snacks and drinks. Due to the overwhelming interest in our camp, early registration is absolutely necessary. We would love to be able to have everybody come, but space and personnel limit the number of kids we are able to accept into our camp each summer. In 2018, we closed registration to our camp on May 14th after 168 kids had registered. Please contact our camp director – Pastor Nathan Nass – with any questions at nass.nathan@gmail.com. We are pleased to offer our camp free of charge for the eighth consecutive year. Our camp is supported by the generous donations of members of Saint Peter Lutheran Church, along with donations from some of our campers. If you would like to give a free-will donation to help defray the costs of our camp, please click on the “Donate to Our Camp” button below to donate through PayPal. Your donations are greatly appreciated and will allow us to continue to offer our camp free to everyone in our community.